Alongside Italy's Gilera and MV Agusta, Honda of Japan perfected the four-cylinder racing engine in the post-WWII years. And while Gilera and MV retired from racing in the late 1950s and 1960s respectively, Honda is still going strong with new generations of fours. The early fours from the Italian and Japanese marques set four cylinders inline across the frame. The current world-winning power plant design is a V-4 mounted transversely. The first Honda V -4 was used as motive power for the VF750S, which turned out to be a disaster for the film. This was followed by the VF750F of 1983, called the Interceptor for the US market. But the chain-driven camshafts of these early V-4s plagued the cycle until a gear drive for the cams was devised to replace the chains. From this new engine emerged the VFR750 and RC30. smaller sibling, the NC30 with a 400cc limited-edition performance engine. With a liquid-cooled engine, cast aluminum double-beam frame, upside-down front forks and single-sided rear swing arm, the RC30 was the best motorcycle money could buy. 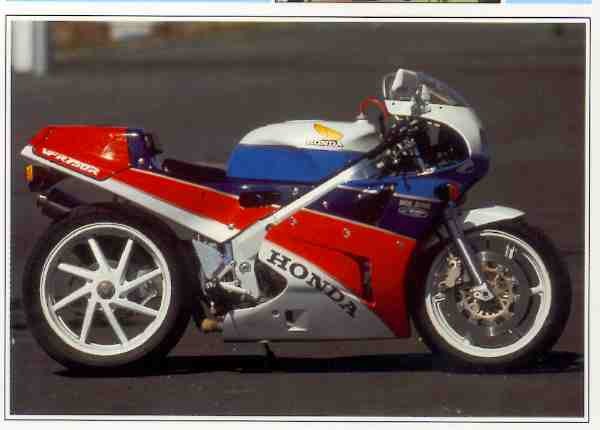 The Honda RC30 is without doubt the best motorcycle. available on the market - but at a price that more than matches its value and exclusivity.